As you all know, HISD is currently pushing a nearly $2 billion bond proposal. That request is bad enough, but they don't stop there. In a stunning misuse of your taxpayer dollars, they're actually placing pro-bond banners on the same buses that you pay for and our children ride. This is a clear violation of the law, but we shouldn't be surprised. This is the same arrogance which drives them to ask for $2 billion when their district is woefully underperforming. 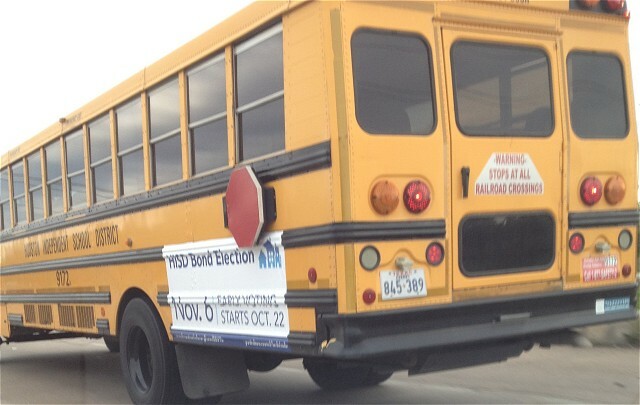 This election, send HISD a message...vote NO for HISD bonds. In wrestling when you have two wrestlers against one, the tag team has a big advantage. So in the "debate" on October 16th, you had Obama and so called "moderator" Candy Crowley vs. Romney. Adding insult to injury, Crowley did not keep the time even, are you shocked? Obama got 11% more time and she repeatedly cut Romney off but not Obama. Her worst offense was the so called fact check after Obama misrepresented his Rose Garden statement after the Benghazi massacre when she said the President mentioned terror as the cause of our American murders. Post-debate she back tracked, but too late for us. Despite all that he faced, Romney did a fine job. TCR Comment: We wonder what the GOP members of the Debate Commission were doing when they picked three left wing journalists as moderators. The fourth was Jim Lehrer, who is fair. Where is a token Conservative Moderator, not to be found? After the "doctored" unemployment rate reduction last month, it's not a surprise that statistics released today show unemployment benefits requests were up 46,000 last week to a seasonably adjusted 388,000, the highest in four months. The Obama recovery is in fact a new recession. TCR Comment: Brilliant professor who gets it, these are important excerpts you need to read. "Almost everything we have been told about Libya over the last two years is untrue." "A free Libya was supposed to be proof of President Obama's enlightened reset Middle East policy". "Libyans, like most in the Arab World, were supposed to appreciate the new enlightened American foreign policy. Obama's June 2009 Cairo speech had praised Islam and apologized for the West. A new "lead from behind" multilateralism was said to have superseded George W. Bush's neo-imperialist interventions of the past. "Obama's mixed-racial identity and his father's Muslim heritage would also win over the hearts and minds of Libyans after the Gadhafi nightmare. During this summer's Democratic convention, Obama supporters trumpeted the successes of his Middle East policy: Osama bin Laden dead, al-Qaeda defanged and Arab Spring reformers in place of dictators. "To keep that shining message viable until the November election, the Obama administration and the media had been willing to overlook or mischaracterize all sorts of disturbing events. "Libya was not so much liberated as descending into the chaos of tribal payback. Former Gadhafi supporters and African mercenaries were executed by those we helped. Islamists began consolidating power, desecrating a British military cemetery and driving out Westerners. "On the 11th anniversary of 9/11, a radical Islamist hit team with heavy weapons stormed the American consulate in Benghazi, killing Ambassador Chris Stevens and three other Americans. "In response, White House Press Secretary Jay Carney, National Intelligence Director James Clapper and U.N. Ambassador Susan Rice desperately insisted that the murders were a one-time, ad hoc demonstration gone awry, without much larger significance. Supposedly, a few Muslim outliers -- inflamed over one American's anti-Islamic Internet video -- had overreacted and stormed the consulate. Such anger was "natural," assured the president. "But why would furor over an obscure, months-old Internet video just happen to coincide with the 9/11 anniversary attack? Do demonstrators customarily bring along rocket-propelled grenades, mortars and heavy machine guns? Why did the Libyan government attribute the killings to an al-Qaeda affiliate when the Obama administration would not? "Forget those questions: For most of September, desperate administration officials still clung to the myth that the Libyan catastrophe was a result of a single obnoxious video. At the United Nations, the president castigated the uncouth film. Secretary of State Hillary Clinton lamented the senseless spontaneous violence that grew out of one American's excesses, as she spoke beside the returning coffins of the slain Americans. "Nonetheless, more disturbing facts kept emerging: Ambassador Stevens repeatedly had warned his State Department superiors in vain of impending Islamist violence. Security personnel -- to no avail -- had also urged beefing up the protection of the consulate, prompting former regional security officer Eric Nordstrom to say in exasperation that "the Taliban is on the inside of the building." Video of the attack revealed that there had been no demonstration at all, but rather a full-fledged terrorist assault. "Even as the fantasy of a spur-of-the-moment demonstration dissipated, administration officials tried to salvage it -- and with it their idealistic policy in the Middle East. Vice President Joe Biden told a flat-out whopper in last week's debate, saying the administration hadn't been informed that Americans in Libya had ever requested more security. He scapegoated the intelligence agencies for supposedly failing to warn the administration of the threat. "The new administration narrative faulted not one video, but the intelligence community for misleading them about the threat of an al-Qaeda hit on an American consulate -- and the Romney campaign for demanding answers about a slain ambassador and his associates. Meanwhile, the State Department, the Obama re-election team and the intelligence community were all pointing fingers at each other. "What the Obama administration could not concede was the truth: The lead-from-behind intervention in Libya had proved a blueprint for nothing. Libya has descended into chaos. Radical Islam had either subverted or hijacked the Arab Spring. Al-Qaeda was not dismantled by the death of bin Laden or by the stepped-up drone assassination missions in Pakistan. Egypt was becoming Islamist; Syria was a bloody mess. Iran was on the way to becoming nuclear. Obama had won America no more good will in the Middle East than had prior presidents. "In other words, the administration's entire experience in Libya -- and in most of the Middle East in general -- has been a bright and shining lie." Victor Davis Hanson is an American military historian, columnist, political essayist and former classics professor, a scholar of ancient warfare. He was for many years a professor of classics at California State University, Fresno, and is currently the Martin and Illie Anderson Senior Fellow at Stanford University's Hoover Institution. 10/19/12 at 7:00pm: Watch the Texas Debates: Race for U.S. Senate 2012.